Automations are part of Workflow Management, a set of Helpshift features which you can use to automatically manage large volumes of Issues quickly and effectively. To learn more about this set of features, please see our Workflow Management guide. Automations can only be set up by Admins. If you are an Agent, please share this with the Admins on your Helpshift account. To learn about additional features, please see our Getting Started page. New Issue Automations (NIA) allow you to assign Issues to specific Agents or Smart Views, add tags, auto resolve Issues, and send custom Autoreplies, all immediately upon Issue creation and based on criteria you define. This criteria could include device information and metadata your developer is tracking, such as app, language, or platform; which email address the issue was sent to; the presence of certain keywords/strings; and the time of day during when the Issue was created. To learn more about adding metadata to your app, please refer your developer to our developer documentation. NIAs also allow you to cater your Autoreplies based on the language of the user’s device, which platform and app they are contacting you on, as well as any customized tags which have already been assigned. 4. In the ‘Create Automation’ pop-up, enter a title for the Automation, then select the conditions (the trigger for the Automation to run) and actions (what the Automation should do with new Issues that meet the criteria of the condition). The available condition options will differ based on which platform you select (SDK, Email or web). If you select an SDK platform (iOS or Android), you’ll be able to select a specific app in your Automation settings. However, if you want to include web Issues in your Automation, app selection will be disabled. This is because we want to be sure your Issues are categorized in the most accurate way possible, and we cannot guarantee users will always select the correct option in your Web Portal’s Contact Us Form. If you want to apply app-specific Automations to email or web Issues, you can add app-specific tags to the Dashboard and have them passed through the Web Portal’s Contact Us Form or even support emails to populate your Issues. To filter your web Issues by app, you can customize the contact form for each app to add an app-specific tag. To filter your email Issues by app, we recommend setting up separate email support channels for each app, and using Automations to apply a tag depending on which email users write into. As an example, if we wanted to set up a New Issue Automation to reply to refund requests that come in during off-hours, we would set it to identify Issues with the tags ‘refund’ or ‘refund request’ that come in outside of the windows of 9am-6pm Monday-Friday. 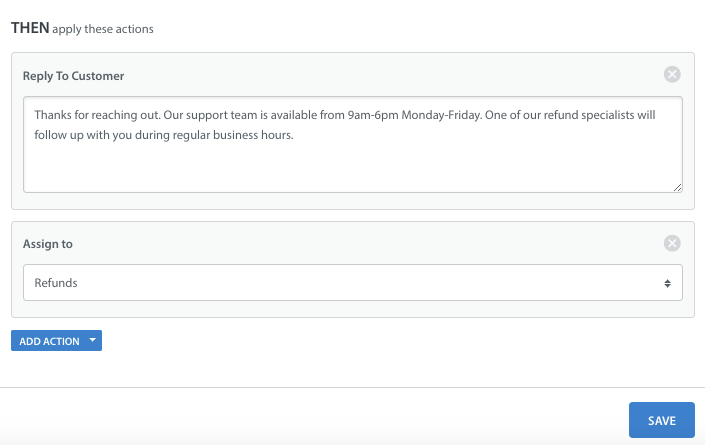 In our refund request example above, we would set the Automation to assign the Issue to the ‘Refunds’ Queue and reply to the customer letting them know that they’ve written in during off hours. Autoresponses can be used to reassure your users that you’ve received their Issue, or provide relevant information based on Issue criteria. 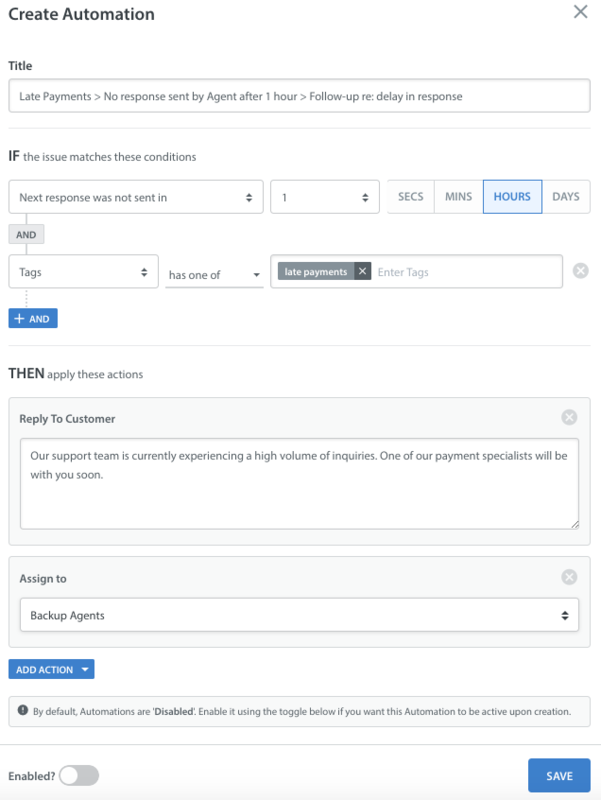 For example, if you have guaranteed SLAs for certain Issue types (such as inquiries from VIPs, or refund requests) you can send an Autoresponse to those users letting them know that they will receive a response in x amount of time. You can automatically tag and assign this Issue to the appropriate Queues or Agents to ensure it is addressed in the expected time frame. You can set up Autoresponses to reply with specific responses depending on the type of Issue. You can have those specific responses triggered by specific tags or keywords. Creating Autoresponses involves creating a modification of a New Issue Automation. Now that you’ve reviewed the steps to create a New Issue Automation, you can use the process in this FAQ to create an Autoresponse: How do I set up Autoresponses? 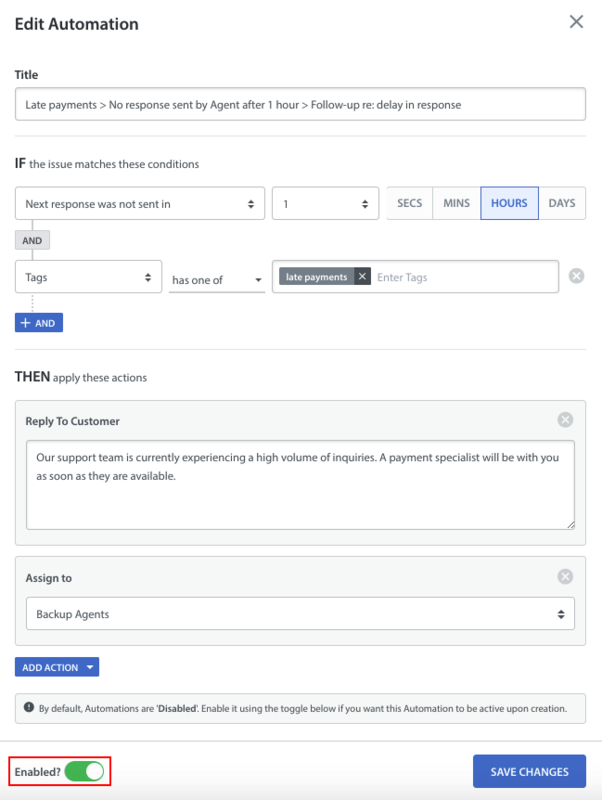 To revisit our example above, if we want to automatically respond to all Issues which have not received an Agent response after 1 hour and which are associated with late payments, we may wish to filter based on the ‘late payments’ tag. Our recommended naming convention is to include the condition and action in the title. For example, if this Automation is intended to add a private note to all open Issues that have received a new response from an Agent and which have the ‘payment’ tag, you may wish to title it something like Late Payments > No response by Agent after 1 hour > Follow-up re: delay in response. As you add more Automations, this naming convention is helpful for keeping track of them. You’ll use a modified Time-Based Automation to create your Reminder Automation. To learn how, please see How do I set up Reminder Automations? Auto Resolve Automations allow you to automatically resolve Issues when you have not heard back from the user after a certain number of days. These are helpful for closing out Issues where the end user has lost interest in order to declutter your Helpshift Dashboard. Like with Reminder Automations, Auto Resolve Automations are a modification of Time-Based Automations. To learn how to set them up, see How do I set up Auto Resolve Automations? 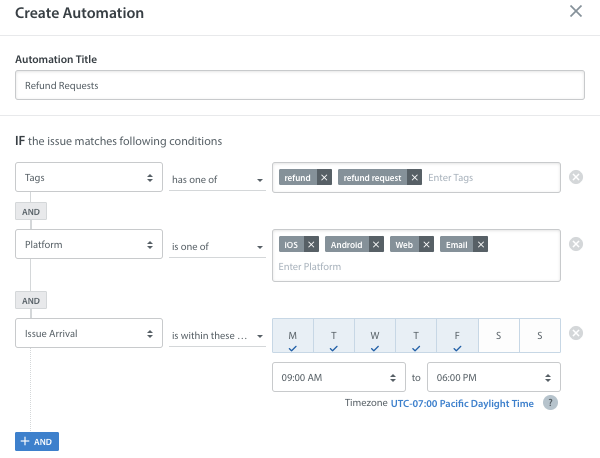 You can use Automations to auto-assign Issues to individual Agents and Queues based on select criteria such as tags, language, time of day, and more. You can even establish working days/hours for Agents and add multiple layers of assignment. This guarantees that new Issues are always assigned appropriately, no matter the time of day. 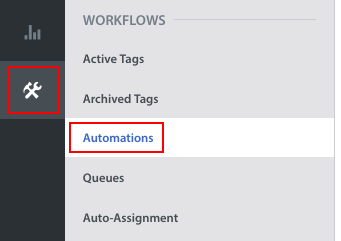 Using Automations to auto-assign Issues is part of a set of Helpshift features known as Workflow Management which are designed to optimize your workflow. To learn more about these features, please see our guide to Workflow Management. The assignment rules in Helpshift are based off of Round Robin. This means that new Issues are assigned evenly to all Agents on a rotating basis based on the Issue Creation timestamp. To use automate Issue assignment effectively, you’ll need to know how to create tags. If you haven’t created tags yet, please see How do I create and use tags? 1. The first step is to create a New Issue Automation (NIA). When creating the NIA, click ‘Add Filter’ and add the fields you’d like to filter by. You can filter by app, platform, language, forwarding email, tags, title or first message, or issue arrival time. To set up NIAs to only assign Issues during Agent working hours, you’ll want to filter by issue arrival time and set the working hours for that Agent. For example, if you create an Automation for ‘Refund Issues’ and your refund processing team only works Mon-Fri 9am-5pm, you would apply the filter ‘tags’ has one of ‘refund’ and Issue arrival is within Mon-Fri 9am-5pm. 2. In the 2nd half of setting up the NIA, click ‘Add Action’ select ‘Assign to’ then select the individual team member, Agent Group, Queue, or Bot you’d like this type of Issue assigned to. In the Refunds example, you would assign the refund to a Refunds Queue. Click ‘Save’ to launch the Automation.